For whatever reason I had missed out on this film over the past year or so, but had heard a number of recommendations and it seemed to get a decent number of positive reviews. So I had been curious to see the film (despite knowing very little about it), and I just happened across a copy at my local public library (which is an overlooked resource for watching movies for free by the way) and decided to give it a shot, and as you can tell from my number score I didn't really like it. You can make comparisons to the character Hit-Girl in the 2010 film Kickass. 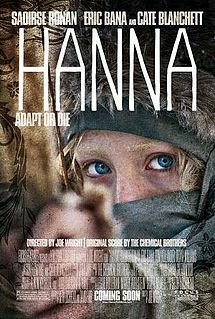 However the difference is Kickass knew it was supposed to be a fun, ridiculous, over the top, comic booky film, Hanna tries to take itself too seriously for its own good. 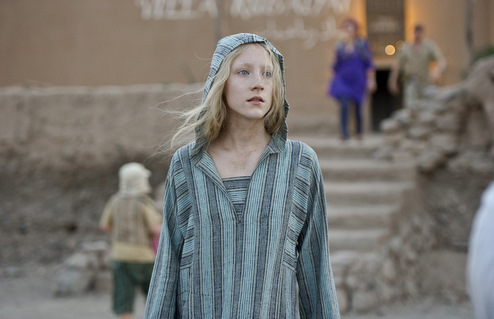 I say it tries to take itself too seriously but then it also does ridiculous things like have Hanna (Saoirse Ronan) make a tough climb to the top of a shaft that leads to the open desert only to grab a hold of the bottom of a fast moving vehicle and hang on for the ride. Never mind that she wouldn't have had time and her arms or fingers may have been ripped off or her innards damaged due to the instantaneous jump from 0 to 50-60 mph, how could she have let go and come to a complete stop (again instantaneously) instead of sliding/scraping across the rough desert landscape. And finally how would the driver not have noticed the cloud of dust as they dropped some unexpected cargo while driving at what looks to be fairly high speed? While this eye-rolling scene is obviously impossible, I can't help wondering what would have been wrong with her simply letting them pass and then once in the clear simply climbing up and walking away? It isn't as though she caught the ride to be taken anywhere in particular. Maybe I'm being too nitpicky, but that isn't the only problem with this film. The fight sequences aren't very impressive either. Yes one of the actors is a young girl, but even if she can't work out the choreography well enough to be convincing then do some editing, some quick cutting, something to hide it. The main story is simple enough, a young girl is raised by a skilled agent to be an assassin. Once old enough she is sent out to complete her mission, but after killing the wrong person she seems willing enough to give up and run for her life, which, if you watched the beginning of the film you'd know, is out of her character and training, but lets forget about that and just assume she was content to have killed the wrong person and moved on (because the film wants us to). The one she was supposed to kill is also an agent of some sort (we don't know for who). She and her team try to track down and kill Hanna and her father. The story is supposed to have depth and intrigue but it doesn't really. It's a rather boring old story line we've heard before that had me shaking my head saying, "not another genetically altered super soldier story." So the truth comes out, she is a genetically altered super soldier and for reasons not stated the program was shut down and all other super soldier children were killed (stop me if you've heard this one before). We can't help but ask questions like why was this program created, why was it shutdown, why is the primary villain so hell-bent on killing Hanna (to the point she will go kill Hanna's grandmother for no reason better than to make us not like her), but these questions are completely ignored. "So what exactly went wrong with Hanna besides false advertising? 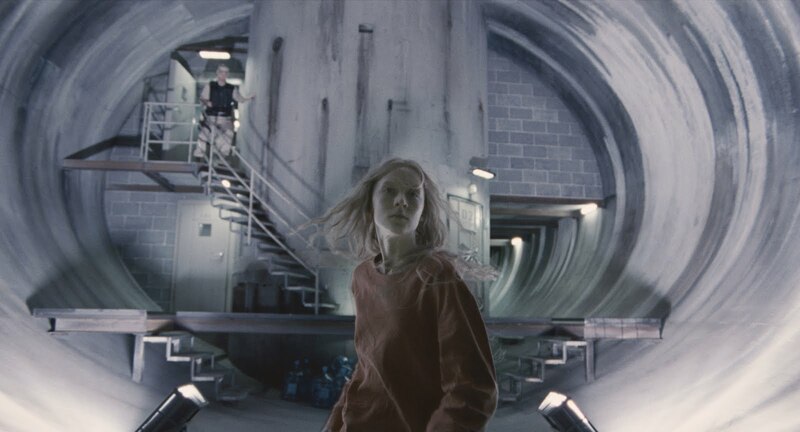 ...after Hanna’s daring escape from the facility, the film slows way, way down to the point where you begin to wonder what the writers were trying to accomplish in the interlude. It’s here in the bizarre, sedated second act where Hanna wanders around Morocco, getting used to being in the outside world. In fact, they could lift out this slow paced, middle section of the film and push the beginning and end together you really wouldn't miss out on anything, and you wouldn't have to sit for quite as long. I was not surprised by anything that happened in this film, from fairly early on I knew essentially everything that would happen. Her father would die, she would find out she had been genetically altered, and all the bad guys would do bad things but pay for it in the end. The film followed through by doing exactly that and nothing more. By the time the credits roll we are left thinking about the fact that these events didn't necessarily have to happen in the first place, but now that they have Hanna will likely live a life on the run from the law and either die while on the run, or go to prison for the rest of her life, or get the death penalty for all the death and destruction she had caused. The more I think about the film the less I think there is to enjoy about it. There were two films about a tough young girl raised to fight and kill by tough father figures who fight and kill, if you wanted to see one of them watch Kickass, at least that film is fun, doesn't take itself too seriously and maintains a far more consistent pace/tone, and is a far more enjoyable experience because of it.